Amy: I'm making a scrapbook of his professional highlights. Newspaper clippings, police reports, pictures. It's got every moment of his career, "From Ray to Z". Amy: I asked the captain what qualified as a gift and he said anything I spend money on. Then I realized, my time is worth nothing. Terry: Sounds like you're bragging, but that's just a sad statement. Charles: Gina, you need to see this. Gina: Oh, Charles. I can't take that. It's clearly not cash, and I don't have time in my life to return things. Amy: Not a gift, snitch. It didn't cost me anything. Just my worthless man hours. Captain Holt: I'm gonna let you figure that one out. Jake is out on the street, dressed as a charity santa on the look out for a perp, while Rosa watches on. When Rosa alerts Jake to Doug Judy, a.k.a the Pontiac Bandit, Jake blows his cover, causing Doug Judy to run. After a chase through a Christmas tree lot, Rosa and Jake apprehend Doug Judy. Back at the precinct, Captain Holt invites the squad to a festive winter party later that week. Jake and Rosa arrive triumphantly with Doug Judy, who tries to bag a plea bargain. Captain Holt isn't interested in doing a deal with Judy, who stitched them up before, until he mentions he could give them information on giggle pig distributors. Meanwhile, Boyle goes to Gina to show her a present for her mom that he found at his dad's house. Gina and Charles are both worried their parents are getting too close. When Terry goes to the break room, he finds Amy making a collage for Captain Holt, despite his no gift policy. Amy claims to have found a loophole in his rules, since this gift won't cost any money - just her worthless man hours. Amy explains she's making a scrapbook of the Captain's career, "From Ray to Z." Jake, Rosa and Captain Holt talk about offering Doug Judy a plea deal. Jake thinks they should only give him a deal if he can offer the biggest giggle pig supplier, Tito Ruiz. Doug Judy agrees to give them Tito in return for a reduced sentence and a few days of luxury at a hotel. Jake, untrusting after his previous encounter with Doug Judy, wants to be on the case and watch Judy closely. Jake, Rosa and Doug Judy arrive at a four-star hotel. Despite his initial uptightness, Jake begins to relax with Doug in hotel bathrobes and with an order of room service. Elsewhere, Gina and Charles open his dad's present to find it's a set of digital scales. They both figure this is a terrible gift that could break their parents up, so they decide to invite them to a restaurant for a gift-exchange dinner that night. After the room service is delivered, Rosa presses Doug Judy to text Tito Luiz so they can meet-up and record him talking about his giggle-pig business. Back at the precinct, Amy worries about her gift for Captain Holt. While looking up his old cases, Amy has identified a mistake in the Brooklyn Broiler case. She doesn't think the Brooklyn Broiler was responsible for three of the fires he was convicted of starting. When Jake, Rosa and Doug Judy arrive at the sting for Tito Ruiz, his body guards pat them down. When Tito wants to see how good Doug Judy actually is, he tells him to steal a car. Jake is reluctant to let him in a car alone, lest he escape, so Jake, as Dante Thunderstorm, breaks into the car himself with the Pontiac Bandit's help. When Jake successfully steals the car, Tito agrees to take them back to his warehouse. At a bar, Darlene Linetti and Lynn Boyle join Gina and Charles for dinner. When Darlene is delighted by Lynn's present, she reveals they are moving in together. Unable to handle the news, Gina takes off. Elsewhere, Amy goes to Holt's office to tell him about the mistake she uncovered in his old case. Holt is not happy she violated his no gift rule and promises he will not peruse the collage, though he will look into the mistake. 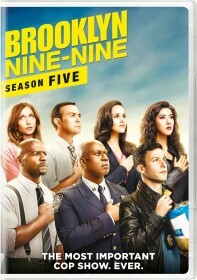 When Jake, Rosa and Doug Judy arrive at Tito's warehouse, their operation is thrown into chaos when a stolen garbage truck crashes into the building, forcing Rosa to call the tactical operations team in early than planned. Jake tries to stop Doug Judy escaping on the garbage truck, but he's forced to choose between stopping Doug Judy and letting Tito Ruiz get away. Jake decides Ruiz is more important and, once again, sees the Pontiac Bandit get away from him. Elsewhere, Captain Holt goes to Amy's desk to thank her for her gift. The Captain explains the reason he doesn't like receiving gifts is that he doesn't like brown-nosing. He respects Amy for pointing out his mistake and, as his gift for her, invites her to join him in re-opening the case. When Gina goes to Charles, he's surprised she is upbeat given their parents' news. Gina explains that they now have a purpose: breaking their parents up. At a bar, Captain Holt gives a toast to Rosa and her task force on bringing down Tito's giggle pig network. When Rosa goes to tell Jake that Doug Judy hasn't surfaced, Jake says he just received a video from Judy showing him on a desert island with his accomplice, the waiter who delivered the room service. Rosa thanks Jake for choosing to capture Tito Ruiz over Doug Judy, and promises Jake they will catch the Pontiac Bandit again.